Ansonia’s (l-r) Avery Hull, Kaden Lane, Mitchell Grieshop, Kaylee Boyer-Diffenderfer and Coleton Thornhill were honored at the 10th annual R.E.A.L. Success Awards Luncheon. Arcanum’s (l-r) Victoria Gross, Trever Mamazza and Austin Oliver were honored at the 10th annual R.E.A.L. Success Awards Luncheon. 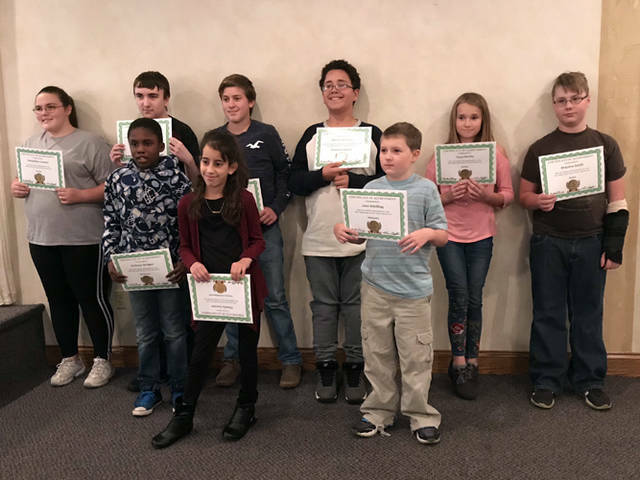 Bradford’s (front row, l-r) Kaleb Huff, Andrea Garner, Lailah Brewer, Isabella Boyer, (back row, l-r) Caden Jay, Cayla Jay, Zane Jones, Dylan Pitman, Ian Pitman and Kira Snyder were honored at the 10th annual R.E.A.L. Success Awards Luncheon. Franklin Monroe’s (l-r) Henri Turner, Brody Edwards, Nick McMillan, Lauren Buhl, Ross Crumrine and Evie Middlestetter were honored at the 10th annual R.E.A.L. Success Awards Luncheon. 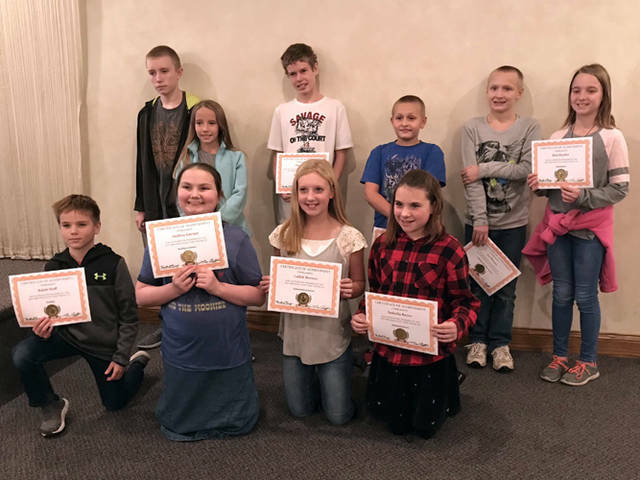 Mississinawa Valley’s (front row, l-r) Anthony Bridges, Chasity Gaynor, Jace Schilling, (back row, l-r) Samantha Couchot, Zackary Binkley, Caden King, Manuel Melchor, Anya Shelby and Braydon Smith were honored at the 10th annual R.E.A.L. Success Awards Luncheon. 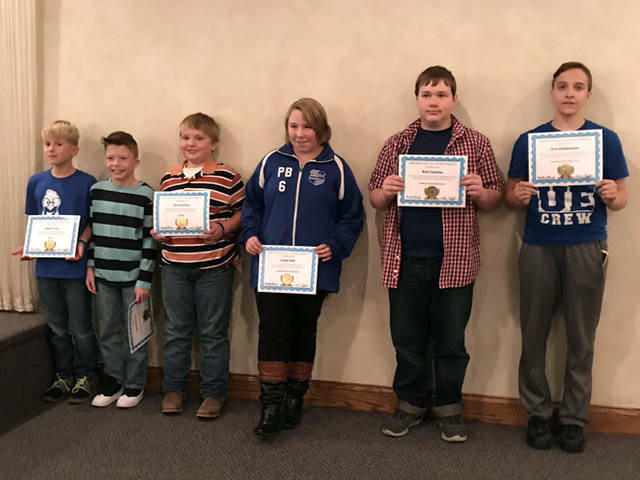 Tri-Village’s (front row), Dennis Seidel (back row, l-r) Ethan Hardy, Madeline Holton, Kaylee Marker, Braden Cockerham , Kaleb Martin, Oakley Martin, Michael Seger and Nathan Wiedmaier were honored at the 10th annual R.E.A.L. Success Awards Luncheon. 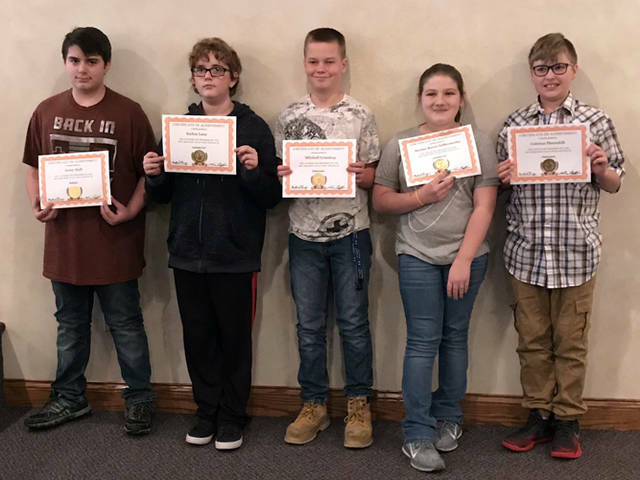 GREENVILLE – Students from six Darke County school districts were honored Thursday as the special education supervisory staff of the Darke County Educational Service Center recognized students for excelling on statewide tests. The 10th annual R.E.A.L. 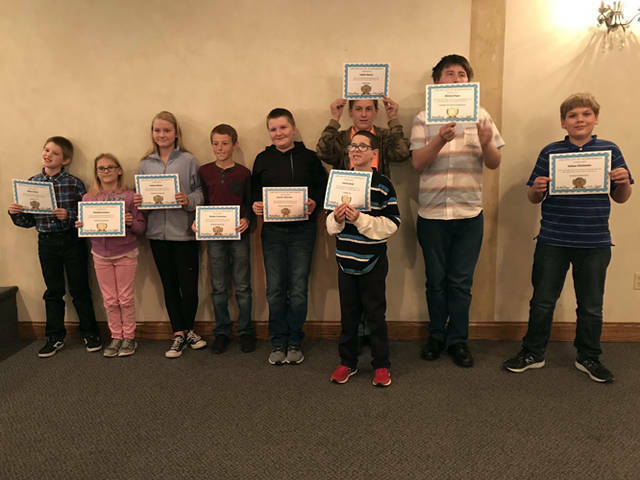 Success Awards Luncheon – an acronym for raising expectations for all learners – at Romer’s Catering in Greenville included students in elementary school through high school at Ansonia, Arcanum, Bradford, Franklin Monroe, Mississinawa Valley and Tri-Village. From Ansonia, Kaylee Boyer-Diffenderfer in advanced language arts, Mitchell Grieshop in accelerated math, Avery Hull in accelerated science, Kaden Lane in accelerated language arts and Coleton Thornhill in advanced math were recognized. 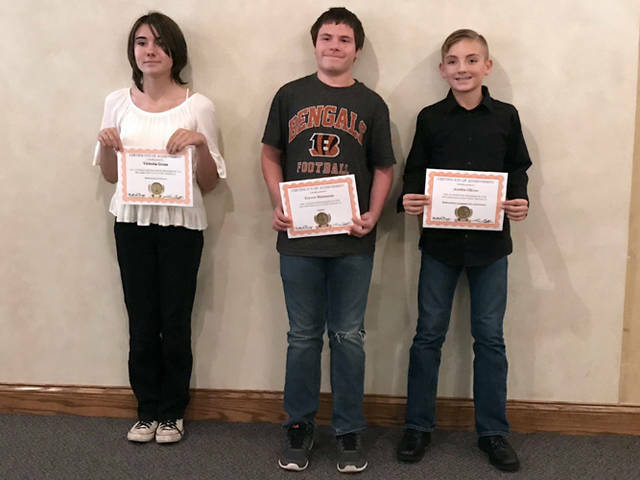 Arcanum’s Victoria Gross in accelerated math and advances science, Trever Mamazza in accelerated science and Austin Oliver in accelerated math, language arts and science each were recognized. Bradford’s Isabella Boyer in accelerated reading and science, Lailah Brewer in accelerated math and science, Kaydee Brown in advanced reading, Andrea Garner in accelerated reading and science, Kaleb Huff in accelerated reading, Cayla Jay in accelerated math, Caden Jay in accelerated reading, math and science, Zane Jones in accelerated math and advanced reading, Ian Pitman in advanced language arts, math and science, Dylan Pitman in accelerated reading and math and Kira Snyder in accelerated math were honored. From Franklin Monroe, Lauren Buhl in advanced language arts and math, Ross Crumrine in advanced language arts and accelerated math, Brody Edwards in advanced reading and accelerated math, Nick McMillan in accelerated reading, Evie Middlestetter in advanced language arts and accelerated math and Henri Turner in advanced reading all were recognized. Mississinawa Valley’s Zackary Binkley in accelerated math and advanced language arts, Anthony Bridges in advanced language arts, Samantha Couchot in advanced reading, Chasity Gaynor in advanced language arts and math, Caden King in advanced language arts, math and science, Manuel Melchor in accelerated math and advanced language arts, Bonnie Parker in advanced reading, Jace Schilling in advanced math, Anya Shelby in accelerated reading and Braydon Smith in accelerated reading were honored. From Tri-Village Braden Cockerham in accelerated reading and math, Ethan Hardy in advanced language arts, Madeline Holton in accelerated reading and math, Kaylee Marker in accelerated reading and math, Kaleb Martin in accelerated reading, math and science, Oakley Martin in accelerated math, Michael Seger in advanced language arts and science plus accelerated math, Dennis Seidel in accelerated language arts and Nathan Wiedmaier in accelerated reading and advanced math were recognized. Gray also recognized the teachers in attendance who helped the students prepare for their tests. The banquet included music from 2016 Tri-Village graduate Knox Morris, who will be a 2019 “American Idol” contestant. The keynote speaker was Kristina Ropos from the Montgomery County Educational Service Center. She spoke about her now 18-year-old son, who has attention-deficit/hyperactivity disorder, which impaired his ability to concentrate and caused challenges in school. Ropos’ son hated school to the point that he would cry when he saw a book and melt down at the prospect of arts and crafts. But in 2010 he asked her to draw for him, and almost a year later he started drawing himself and focusing more. Ropos said she openly wept in front of coworkers as she saw her son’s progress after years of struggles. “I knew what was inside of him and what he was capable of,” she said of her son, who now is studying in a graphics arts program and is working to become a professional artist. Gray closed the banquet reminding the students that they all have worth, which he demonstrated with a crumbled $10 bill that he stomped on. “No matter what I did to the $10 bill, you still wanted it because it did not decrease in value,” Gray told the students. “No matter what has happened or what will happen, you will never lose your value. Kyle Shaner may be reached at 937-569-4316. Follow me on Twitter @KShanerAdvocate or get updates on Facebook by searching Darke County Sports or Advocate 360. For more features online go to dailyadvocate.com. This entry was tagged Ansonia, Arcanum, Bradford, Darke County Educational Service Center, Darke County ESC, ESC, FM, Franklin Monroe, Mississinawa Valley, MV, New Madison, Pitsburg, R.E.A.L. Success Awards Luncheon, Tri-Village, Union City. Bookmark the permalink.